The X-Rite Colormunki Display is accurate and gives no obvious colour biases, and its easy-to-use software assists the calibration process well. It's not the fastest or cheapest device around of its kind, though. The X-Rite Colormunki Display is a tool used to calibrate monitors and projectors. It comes in an easy-to-use software package that enables amateurs and experts alike to fine tune devices to show the best possible colour accuracy. To get started you'll need to download the latest version of X-Rite's Colormunki Display software, which is available from the company's website. Once installed you'll get access to step-by-step guides and video tutorials that make the calibration process a breeze. When you buy a new laptop or monitor, you'd be forgiven for not necessarily thinking it needs calibrating - particularly if your new gadget cost an arm and a leg. As such, it's surprising just how much difference using a calibration tool can make to the appearance of your display and how much more enjoyable it can be to use. If you're a professional - whether that's in photography, design or another field - having a correctly calibrated display can mean the difference between whether you're able to do your job properly or not. Ambient light is swiftly measured while display flare may also be taken into account, and the process takes under 10 minutes from start to finish. The results appear accurate, and the various image samples allow quick before and after comparisons post-calibration. It's not the cheapest or fastest device, but it's ideal for those new to the process. 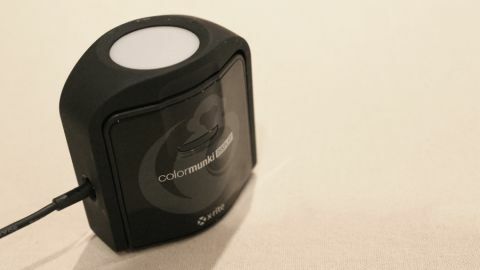 The X-Rite Colormunki Display is an inexpensive monitor calibration device, which promises advanced control with ease of use. Capable of profiling wide-gamut displays and even projectors, the package contains a colorimeter complete with a diffuser panel, together with software and a Quick Start Guide. Following the latter enables even first time users to quickly get to grips with its operation, while the profiling process may be run in either Easy or Advanced modes, depending on the user's skill level and desired control. There's even the option to calibrate Android and Apple iOS devices using a free ColorTRUE mobile app for those who want to make the most of their investment. Once the software has been installed, an ambient light reading may be taken and calibration can begin. Everything is explained clearly and diagrams are provided, although video tutorials are also on hand should the user get stuck. The software takes around two minutes to adjust the display's luminance using a series of patches, before the remainder are displayed and measured over an additional five minutes. Approximate timings are given throughout the process, and once complete it's possible to view before and after comparisons using a range of images. The advanced controls enable you to measure flare from your display and to take this into account, along with white point specification and other options. Overall, there's very little not to like: the results appear accurate and no obvious colour biases can be observed, and reminders can be set up should the lighting conditions change or if a large period of time elapses between calibrations. The only minor niggle is that although it works in much the same way as the i1 Display Pro device, it's considerably slower (but you should bear in mind that it's around £50 cheaper too). The X-Rite Colormunki display will set you back £199 and retails in the US for $189 ($229.95 in Australia). Still, for the novice user performing occasional calibrations, it's pretty much spot on, colour casts will be banished and all your future image adjustments accurate and worthwhile.